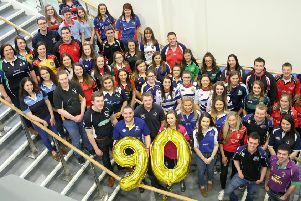 Dungiven YFC have had a busy few months taking part in competitions such as public speaking. Well done to all the members who took part and well done to James Purcell who got through to the finals. Members also took part in the floral art competition and well done to Caroleena Smyth who got first place in her age group. At the recent Co Londonderry dinner dance Dungiven YFC won best club in the county along with James Purcell winning best club leader, Lauren McFarlane winning best PRO, David Oliver winning best senior member and Joanna Mullan winning best junior member. Some members of the club recently helped out by doing charity work which involved loading a lorry in aid of the Christmas shoebox appeal which takes the shoeboxes to children who would not receive very many gifts at Christmas time.